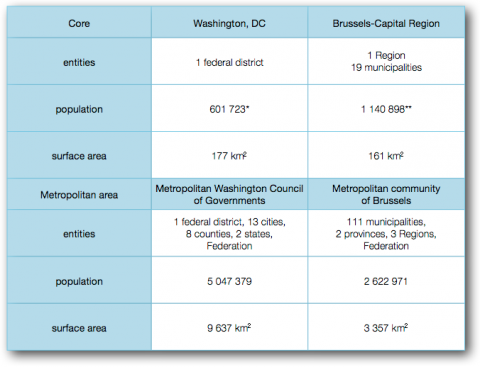 Brussels and Washington: two federal capital cities with two similar metropolitan experiences? Bruxelles et Washington : deux capitales fédérales enclavées, deux expériences métropolitaines comparables ? Brussel en Washington: twee ingesloten federale hoofdsteden, twee vergelijkbare metropolitane experimenten? This article follows a comparative study mission. It shows that the metropolitan development of Brussels is clearly atypical when compared to the literature or the example of Washington, DC. It falls within the scope of Belgian mechanisms of compromise rather than the implementation of classic models of metropolitan cooperation, which often emphasise the voluntary involvement of the different stakeholders. In the case of Brussels, the metropolitan reality was imposed “from above”, even if it was claimed by some of the partners of the state reform. Contrary to Washington, there are no incentives planned by the federal authorities. 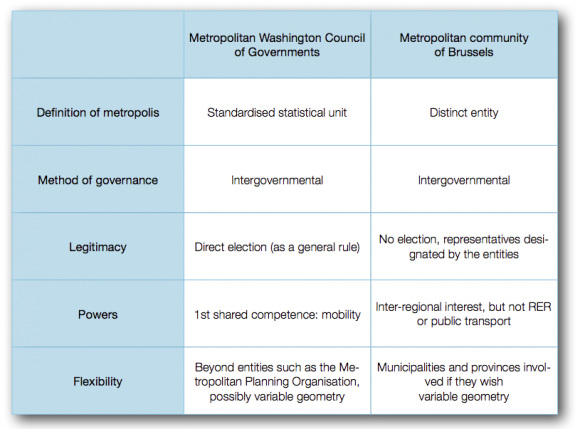 The Brussels metropolitan community is also unique because this structure is not applicable to other big cities in the country, whereas the metropolitan organisation in Washington simply applies a rule which is common to all major American cities. The comparison also underlines the time required for cooperation to take root. Metropolitan cooperation has been practised in Washington for more than sixty years and has developed gradually, starting with the most straightforward issues such as public transport. L’article fait suite à une mission d’étude comparative. Il montre que l’approche métropolitaine actuellement à l’œuvre à Bruxelles est très atypique si on la confronte à la littérature ou à l’exemple américain de Washington, DC. Elle relève plus de mécanismes belgo-belges de compromis que de la mise en œuvre de modèles classiques de coopération métropolitaine, qui mettent souvent l’accent sur l’implication volontaire des différents acteurs. Dans le cas bruxellois, le fait métropolitain s’est finalement imposé « par en haut », même si elle était réclamée par une partie des partenaires de la réforme de l’État. Mais contrairement au cadre américain, aucun incitant n’est prévu par l’autorité fédérale. La communauté métropolitaine bruxelloise est aussi spécifique parce que cette structure n’est pas prévue pour d’autres grandes villes du pays, alors que l’organisation métropolitaine de Washington ne fait qu’appliquer une règle commune à toutes les grandes villes américaines. La comparaison souligne aussi le temps nécessaire à la mise en place de la coopération. La concertation métropolitaine est pratiquée à Washington depuis plus de 60 ans et s’est faite progressivement en commençant par les domaines où c’était le plus évident, comme les transports publics. Dit artikel sluit aan op een studiebezoek van de auteur in het kader van een vergelijking tussen Brussel en Washington. Het artikel toont aan dat de metropolitane benadering die thans voor Brussel wordt gevolgd, zeer atypisch is in vergelijking met de literatuur of het Amerikaanse voorbeeld van Washington, DC en veeleer voortvloeit uit een typisch Belgisch compromis dan uit de toepassing van klassieke modellen voor metropolitane samenwerking, die vaak de klemtoon leggen op het voluntarisme van de verschillende actoren. In het Brussels geval wordt de Hoofdstedelijke Gemeenschap “van bovenaf” opgelegd, ook al werd daarop aangedrongen door een aantal partijen die deelnamen aan de onderhandelingen over de federale staatshervorming. In tegenstelling tot wat in Amerika het geval is, heeft de federale overheid in geen enkele stimulans voorzien. De Brusselse Hoofdstedelijke Gemeenschap is dan ook een structuur sui generis, omdat ze niet bestemd is voor andere grote steden van het land, terwijl voor de metropolitane organisatie van Washington enkel een regel wordt toegepast die voor alle grote Amerikaanse steden geldt. De vergelijking legt ook de nadruk op de tijd die nodig is om samenwerking tot stand te brengen. In Washington bestaat er al meer dan 60 jaar een traditie van metropolitaan overleg, die geleidelijk tot stand is gekomen, te beginnen met de gebieden waar dat het meest voor de hand lag, namelijk het openbaar vervoer. 1. A metropolitan community for Brussels? 3. A concept which is applicable to all big cities? 4. A specific model for federal capitals? 1This text follows a study mission in Washington conducted by the author in October 2010. The study was prompted by the German Marshall Fund1 which provided support and organised meetings with different participants (among others, DC Administration and Chief Financial Officer, Washington Metropolitan Area Transit Authority, Metropolitan Washington Council of Governments and the National Capital Planning Commission), and benefitted from the financial support of the Ministry of the Brussels-Capital Region. The aim of the trip was to highlight the lessons which Brussels could learn from Washington in terms of metropolitan organisation. This article discusses the main points. 2In 2012, in the framework of the sixth state reform2, a metropolitan community around Brussels was created following the adoption of a special law. This text, however, does not define the notion of metropolis, whose borders should, in this case, correspond to those of Brabant. This does not coincide with the results of studies on the subject, including the one conducted by Luyten and Van Hecke  according to which the “stadsgewest” of Brussels is made up of only 62 municipalities. 3The notion of metropolitan community refers to the exceeding of administrative boundaries. It involves “urban regions which develop along functional networks, cutting across the boundaries of existing local, regional and sometimes even national governments” [Kübler, Schwab, 2007: 473]. This requires making a territory correspond to its sphere of influence without modifying the official limits. This definition is based on an essentially functional notion. It does not impose a specific form of government. The management of public policies in these territories may take on various forms. Political analyst Daniel Kübler points out that we may “consider the capacity to govern urban areas as the capacity to achieve negotiated coordination” [2005: 87]. Therefore, he insists on the voluntarism of stakeholders, which itself results from the combination of three factors. They must first be convinced that coordination on a larger scale is positive in terms of benefits. Next, higher levels of government (regional, federal and the European Union) must implement incentives for collaboration, following the example of US federal aid for metropolises. Finally, true leadership is required in order to bring stakeholders together for a project. Another question should be added to these elements, namely that of legitimacy which, ideally, necessitates an election. 4Taylor and Bassett envisage two types of metropolitan organisation. Firstly, according to a classical approach, a model of government, i.e. an entanglement of formal hierarchical structures [Taylor & Bassett, 2007: 120], could continue to be chosen according to two possibilities: the metropolitan government could take the form of a new level of power or that of a consolidation based on a merging of entities. Secondly, a more modern and flexible option would be that of governance, i.e. a way of “linking organisations horizontally through cooperation” [Taylor & Bassett, 2007: 119]. Thus, once again with respect to the exceeding of boundaries, “the significance of local boundaries is reduced by interlocal agreements and joint ventures that enable localities to pool their resources to provide and receive services across borders” [Taylor & Bassett, 2007: 121]. It is therefore an alternative to the modification of boundaries and the implications it could have, since this would presuppose the expanding of one territory to the detriment of another (the city spreads into the surrounding areas). Resistance to these modifications may be due to different stakeholders: the populations on the outskirts incorporated in the city who are worried about increased taxation and a loss of the “rural” character of their neighbourhoods; the populations in the city centre who are reluctant to have to finance the annexation of new territories and the extension of the city; and the bordering villages which would lose against these new urban areas [Taylor & Bassett, 2007: 122]. In the case of Brussels, let us mention certain reservations on behalf of the Flemish related to the use of languages, with the concern that the entire metropolitan area would become officially bilingual. 5Although metropolitan development no longer takes place today in a perspective exclusively focused on economies of scale and thus on greater efficiency, it is impossible to present an article which deals with metropolitan development in the United States without mentioning the previous works by Vincent Ostrom and his colleagues. By adopting a Public Choice economic approach, in opposition to the different reformist movements of the past, Bish and Ostrom (1979) denounce, on the one hand, the perspectives which disparage the fragmentation of power and the superposing of authorities within metropolitan areas, as well as, on the other hand, the studies which show that the metropolitan bodies are too far removed from local realities to manage the scope of powers appropriately. Thus, the approach which they suggest “begins with individuals, considers the nature of public goods and services and explores how differently organised systems of urban governments satisfy individual preferences for public goods and services” [Bish, Ostrom, 1979: 1]. 6There is therefore not just one ideal model to manage all powers in a metropolitan area. Different mechanisms may be considered according to the needs, but also according to the matters. In order to express interests best, mechanisms for intergovernmental relations may be implemented by contracting commitments. The institutional interpretation of this type of entity is complex, but, according to the upholders of Public Choice [Bish & Ostrom, 1979] – political analysts using economic tools in particular to explain political behavior – it is the only option capable of providing appropriate responses to various situations. 7The famous expression “Brussels, DC” aimed at transforming the Brussels-Capital Region into a European district has already been explored from an institutional angle [Van Wynsberghe and Franck, 2009], but the American capital is comparable in another way: its surface area, geographic position as an enclave within another state, its socioeconomic problems, etc. are relatively similar to those of Brussels. 8In the United States, a metropolitan area is a statistical notion used in order to stimulate regional development, in particular via federal financing programmes as part of certain public policies. A metropolis is an urban area with a certain population density with adjacent communities on the outskirts which are strongly tied – economically or socially – to the centre [US Census]. The most populated entity of each urban area is thus considered as the main city. According to this definition, the metropolis of Washington covers the cities and counties situated in Maryland and Virginia and, to a much lesser degree, in West Virginia. In this article we refer to the territory covered by the Metropolitan Washington Council of Governments (MWCOG or COG). 9The sixth Belgian state reform established the idea of the metropolitan community, without defining the concept. The use of the term “metropolitan” refers to somewhat hazily defined boundaries of the urban area, while underlining the functional aspects. In Europe, there are probably as many metropolitan examples as there are criteria which determine their boundaries, the designation of the type of stakeholders involved, the spheres of competence to be shared and the governing bodies. In the United States, this statistical reality standardised on a national scale3 leads to the development of public policies within the remit of federal programmes, whose implementation is left to the regional platform recognised as a representative. In European cases, it may be asserted that a city constitutes the centre, but this is the only certitude, unlike its official boundaries or its role. 4 In this text, the term “Region” with an upper case letter refers to the Belgian federated entity. 10In Belgium, a precise definition does not exist at administrative level, and furthermore, the special law adopted in summer 2012 concerns only the metropolitan development of Brussels, while other big cities could meet the general criteria and participate in a common programme. This involves special legislation adopted in order to settle a particular case, namely that of going beyond the administrative boundaries of the only bilingual area of Brussels whose hinterland covers part of the territory of the two other Regions,4 i.e. a miniature version of Belgium. 11Brussels5 and Washington are both capitals of federations and constitute regional centres of attraction. Historically, Washington DC is the first federal capital to have taken the form of a federal district, i.e. “a distinct federated entity with federal priority and variable autonomy” [Van Wynsberghe, 2003: 65]. This definition highlights a certain ascendancy of the federal authorities and therefore indicates a potential lack of autonomy. While the comparison with Brussels cannot be made based on status, the late recognition of Brussels as a federated entity (1989 instead of 1980 for Flanders and Wallonia) led the national authorities to take on the regional powers in the meantime. Furthermore, the status of Brussels remains limited, with the federal level preserving a right of scrutiny in certain matters. 12The American capital was established in 1790 in the District of Columbia in territories given to the federal government by the states of Maryland and Virginia. By establishing this federal district, the founding fathers wished to ensure the independence of the federal government. In terms of territory, the district underwent a modification of its boundaries in 1846 when Virginia received its land back, limiting the District of Columbia to the part given by Maryland. In the 19th century, the American Congress and president had undeniable supervisory powers in the district [Hanson & Ross, 1973: 93‑96], as the management of the capital took place via committees whose members did not have to explain their acts to the local authorities. The lack of autonomy (self-government) was a problem pointed out by the inhabitants of Washington DC. In 1963, the citizens of the capital were finally granted the right to elect the president and vice-president of the United States. Since 1973 and the Home Rule Act, the local decision-making power has been held typically by the council of the District of Columbia. This municipal council is composed of thirteen members: five members (including the president) are elected based on the entire territory of the capital, whereas the eight other members are elected according to a smaller district (ward). A mayor is also elected for four years. The council approves the district’s annual budget and the financial plan. It also supervises the work of government agencies (local). Nevertheless, there is not complete autonomy, as the federal Congress has a right of veto on the implementation of the city’s legislation and on the budget. 13Given the evolution with respect to its status of district, the metropolitan development of Washington appears to be more consensual. The fact that it is a (central) entity among others, forming a platform under the impetus of federal programmes allows Washington to play its role to the fullest as a major city within a regional urban area and to negotiate public policies of regional interest with the neighbouring municipalities and counties, like any other central city in the country. Due to its status of district (and not of city or state), the US capital city faces very specific problems, such as the banning of taxation of commuters or the existence of federal supervisory powers. However, apart from these limitations, it has similar powers to those of other cities, and even counties and states. 14Conversely, while the Brussels-Capital Region has the status of federated entity, its participation in a metropolitan area is not an obvious political fact. The explanation is not related to the status of federal capital city, but to the fact that it is the only bilingual area in the country and that Brussels has several positions within the structure of Belgium. 15At institutional level, as a Region created in 1989, the Brussels-Capital Region is a full federated entity, while also being an urban area made up of municipalities, which, to a certain extent, makes it a city-state, without two levels being involved, as is the case in Berlin and Vienna. 16The community problem often referred to as being specific to Brussels is – since the creation of the Region in 1989 – situated outside the regional boundaries, i.e. it concerns the outskirts. It has a dual nature which is, on the one hand, related to the exercising of the right to vote and, on the other hand, to the protection of the francophone minority on the outskirts of Brussels via the mechanism of “linguistic options” (possibility to deal with the administration in the other national language in some municipalities where a national linguistic minority was recognised when the linguistic border was established in 1962). The first aspect was supposed to be settled following the sixth state reform. At first glance, the problem of the Brussels-Halle-Vilvoorde (BHV) electoral district and that of the linguistic options are not related. The split does not affect the system of linguistic options. Nevertheless, the concerns created by the first aspect have made it common to mix the related stakes. As linguistic options are often questioned, their disappearance may be the next political priority following the BHV split. In this case, the linguistic border would then become the only existing administrative boundary. International case law tends to confirm internal administrative boundaries as external boundaries. The institution of a metropolitan community – at least on paper as is the case since the adoption of the special law – thus allows a certain vagueness to be maintained regarding the boundaries of Brussels and its sphere of influence. We put forth the hypothesis that this involved the deliberate will of the francophone parties to avoid the unequivocal recognition of the linguistic border as a possible future state border. 17The Council of Governments (COG) is the platform in charge of metropolitan coordination, alongside the Washington Metropolitan Area Transit Authority (WMATA). Established in 1957, the original missions of the COG are related to economic growth, housing, the environment, public health and security, as well as transport, which is one of the most important items in the district’s budget. The COG is an example of the way in which intergovernmental relations sometimes take place in Washington in particular, and in the United States more generally. The COG constitutes an umbrella covering three other bodies: Board of Directors, Transportation Planning Board and Metropolitan Washington Air Quality Committee. They all have the characteristic of being made up of representatives of municipalities and counties as well as the District of Columbia, and even representatives of the Federation (via Congress). They constitute opportunities for dialogue which are also open to the different stakeholders, including citizens. American political practice is based on the election of representatives by citizens (not only the members of the municipal council or the mayor), more frequently than in Belgium. In most metropolitan bodies, the local representatives are usually elected, as well as the public prosecutors, the members of the district school board and the sheriffs. 18In 2010, its Board of Directors approved the “Region Forward” global plan, which focuses on environmental, economic and transport-related objectives. It was developed by the Greater Washington 2050 Coalition. The latter term is used in order to take into account as best as possible the shared involvement of stakeholders from different areas: administration and public sector, companies, ecological/environmental movements and civil society in general. The agreement presupposed a commitment on behalf of member governments of the COG. This coalition of interests constitutes an additional long-term (50 years) initiative aimed at improving the quality of life of residents of the metropolitan area. 19The Transportation Planning Board (TPB) is an intergovernmental organisation whose implementation in 1965 was prompted by a federal programme (Federal Aid Highway Act of 1962), which was based on previous motorway development plans throughout the United States. It therefore has the specific form of a Metropolitan Planning Organisation (MPO), whose establishment in all urbanised areas was required by Congress and which is not only based on the deployment of the motorway network, but also on the extension of mass transport. The construction of large transport-related infrastructures6 could only have taken place through the coordination between entities which are within the remit of different levels (local and state), which is probably a characteristic of the Public Choice approach. The TPB, like the COG in general, constitutes a centre of expertise which offers resources in the area of technical knowledge for decision-making. In this case as well, there are elements of intergovernmental relations, as the COG must work in close collaboration with the people responsible for transport in the member entities as well as the WMATA. 20The third body under the umbrella of the COG is the Metropolitan Washington Air Quality Committee. It demonstrates how metropolitan implications vary with the circumstances, in the same way as Public Choice, as three other counties joined this committee. 21In addition to the committees under the umbrella of the COG, the WMATA is the central coordination body for public transport within the metropolis, as it has organised and managed the bus and underground railway network since 1967. Once again, it is an agency based on an inter-state agreement, i.e. Maryland, Virginia and the District of Columbia, validated by the US Congress, with two representatives for each of the entities. Contrary to the bodies in the COG, the WMATA does not simply plan or provide expertise for projects beforehand. Its field of activity includes the development and financing of the network, provided that measures are approved by the partners who are signatories of the agreement and who contribute to the financing of the agency and its projects according to a scale which is proportional to the means and needs of everyone. During the winter of 2010, the governance and the actual missions of this body were questioned in a report written by a task force composed of representatives of the COG and the Washington Board of Trade. Since then, a reform has been under way and has led to the replacement of many directors. 22The law adopted in July 2012 by the eight parties which had taken part in the state reform established a metropolitan community whose ex-officio members would be the three Regions, the federal state and the municipalities of the former province of Brabant, as well the provinces of Flemish Brabant and Walloon Brabant, if they wished. The urban area would thus be made up of public authorities and not of private stakeholders or representatives of civil society. Contrary to a project such as the Greater Washington 2050 Coalition, there are no initiatives combining political, private and civil society stakeholders within the Brussels metropolitan space. While Brussels, Flemish and Walloon employers have agreed on the Brussels Metropolitan 2018 plan, the resulting actions are not coordinated with partners other than those from the economic sphere. Furthermore, the metropolitan community as established by the special law of 2012 only grants a role to the public authorities mentioned above. 7 Certain municipalities are part of counties, and others are “independent”. 23Matters coordinated within this metropolitan community should come within the remit of the Regions and be of “transregional importance”, such as employment, economy, regional development, mobility, public works and the environment. Given the dispersion and overlapping of spheres of action, the implication of municipalities indeed makes sense. In that respect, the example of Washington is pertinent considering the multiplicity of the levels of authority concerned (states, DC, counties and municipalities7). It is a major challenge in the management of Brussels where, today, some regret the lack of coordination and the coexistence of regional and municipal mobility, urbanism, etc. policies. The metropolitan project however does not aim to find a solution to this shortcoming, but it could possibly provide a structural answer “from the outside”, under the condition that the municipalities of Brussels agree on a common position. 24Furthermore, the particularly problematic issue of the management of the motorway ring road around Brussels will be entrusted to this metropolitan community which will also become the place of consultation regarding the entrances onto and exits from the Brussels ring road. The RER network – another key challenge related to mobility from and to Brussels – resulted from this new entity. The federal level and the three Regions will form an ad hoc structure within the SNCB which will be responsible for the management of the works. The operator thus has priority in the management of the urban area. However, nothing is mentioned about the underground-bus-tram sections of the public transport policy. STIB, De Lijn and TEC, the regional public transport companies, are not connected with an umbrella structure, whereas in the framework of the US metropolis, transport was a precursory lever in the area of cooperation. By forming metropolitan bodies, they were able to lay claim to federal financing allocated to structures established throughout the country. In Brussels, the Beliris cooperation agreement between the federal authorities and the Region allows the co-financing of certain mobility projects, but this does not come under a global programme at federal level. On the contrary, it provides one-off answers to specific needs in Brussels, limited to its 19 municipalities (therefore, Beliris is not involved in projects which concern the whole metropolitan community). 25Furthermore, the special law is silent as regards the method of functioning of this metropolitan community. The French-style structure can be excluded, with the urban community functioning according to the inter-municipal model with shared municipal powers [Van Wynsberghe et al, 2009]. It should be mentioned that previously, nothing prevented the Regions from signing cooperation agreements. However, they have the drawback of not being able to involve the municipalities whose participation is essential. In short, a special law will implement a structure, the bulk of which remains unknown, apart from the fact that it will include representatives of regional governments – if nevertheless they sign the cooperation agreement – and that the federal authorities and municipalities (and provinces) will also be members. In that respect, the different bodies developed in the metropolis of Washington have relatively comparable experiences, with certain elements which could be transposable, such as the fact that they constitute cooperation platforms of a possibly variable size (involving interested municipalities or those which are the most concerned) and are focused on one object instead of having multiple functions. 26In the same logic as in Washington, it may be assumed that the method of functioning will be intergovernmental and – in keeping with Belgian tradition – based on consensus, namely that the decisions will not be taken based on agreement by the qualified majority, but by unanimous agreement, with each member supporting the decision (and thus having a sort of right of veto). The exercise of powers should not be delegated to an umbrella body, nor should a metropolitan assembly be elected to guarantee a certain democratic legitimacy. Furthermore, the method of inclusion of municipalities and their weight in the structure is not known. Their participation will take place on a voluntary basis, but will a quorum be set? 27Conversely, unlike the United States, it is not part of Belgian political culture for citizens to elect representatives, apart from the members of deliberative assemblies (municipal councils) or legislative assemblies (parliaments). As the political coordination between the different entities and levels of power is in practice the responsibility of political parties, they must continue to nominate local representatives in metropolitan committees. It cannot be overlooked that in the end a dialogue committee closer to the CIPE (Conférence interministérielle de politique étrangère) will be implemented, thus leaving representatives of the different local and regional executives with the responsibility of determining the main lines of metropolitan policy and of limiting themselves to this – minor – type of consultation. 28The limits to decoding this special law and making a comparison with Washington have been reached. Let us recall that it is a political agreement integrated into a negotiation which is aimed at more than simply the best management of the metropolitan space around Brussels. The metropolitan community is of course provided for, but the text is vague enough to allow every interpretation, and especially every possible implementation. 29Let us mention a fundamental difference between Belgium and the United States: the latter does not experience centrifugal tendencies like those which exist in our country. While the Belgian political centre is gradually ridding itself of all of the issues for which an agreement has been impossible, the United States is a federation established by the union of entities. The logic is therefore completely reversed, which – apart from the aspects related to political culture and legitimacy – greatly limits the pertinence of the comparison of the two metropolitan spaces, not to mention the problem related to the use of languages within the Brussels metropolis, even if one of the goals of metropolitan development is to be able to exceed the boundaries without touching them. Apart from the question of the languages used in the debates within the metropolitan community which will have to be settled immediately, public policies managed by this body will have to comply with the linguistic laws in force. 30When compared to the literature or the example of the US capital city, the metropolitan development of Brussels is clearly atypical, falling within the scope of Belgian mechanisms of compromise, with – paradoxically – a strong centrifugal component. 31According to the authors and models presented here, the Brussels metropolitan community is not in keeping with the option of consolidation. Just as the boundaries of the municipalities of Brussels are left untouched, there is no merging of the towns which form the metropolis. Furthermore, the local stakeholders should not be considered as being the most appropriate representatives as – on the contrary – a more large-scale dialogue is foreseen. The objectives are not to aim for greater efficiency via economies of scale, nor to reduce the disparities between Brussels and its hinterland, as New Regionalism tends to claim. The Public Choice approach which is typically American and applied in Washington, may prove to be closest to the formula adopted in Brussels, which as of yet we know very little about. 32The main specificity of the Brussels metropolitan community is that it is a unique model, as the federal negotiators have not seen fit to develop a structure which would be applicable to other big cities in the country. In that respect, it is an ad hoc response to a problem which is specific to Brussels. It may therefore be seen as a typical centrifugal response, as the federal level avoids the question and leaves it up to the Regions to settle a problem which it is unable to deal with. Therefore, by requiring an agreement between the three Regions, the problem is simply shifted. 33This probably also explains why the case of Brussels does not meet the theoretical criteria emphasising the voluntary and proactive dimension of the different stakeholders. Apart from the Citizens’ Forum of Brussels, few initiatives gathering large parts of civil society have existed. Furthermore, more than the administrative boundaries, the linguistic border and the double party system (established with respect to the Communities) are serious obstacles to cooperation, as political stakeholders address their own Community and not the entire population concerned. This most likely explains why the Brussels metropolis is clearly imposed “from above”, even if it was claimed by some of the partners of the state reform (essentially francophone). Most of them are probably convinced of the benefits (mainly economic) of the mechanism, but the costs (political and symbolic) remain too high for many to support the project openly and fully. Contrary to Washington, there are no incentives (even negative, taking the form of sanctions) planned by the federal authorities, nor is there a deadline. A cynical interpretation of the state reform agreement may lead one to think that the metropolitan community is not destined to be implemented in the field, as its mere legal creation “on paper” is enough to satisfy all of the partners. In these circumstances, the questions regarding leadership and legitimacy do not have to be raised. Finally, metropolitan cooperation is a long-standing practice (for some sixty years) in the United States in general and in Washington in particular. There has therefore been enough time for trust to take root, which is far from being the case in Belgium where there is clearly a centrifugal tendency. BISH, R.L. & OSTROM, V., 1979. Understanding Urban Government, Metropolitan Reform Reconsidered. Washington, DC: AEIPPR, Domestic Affairs Study 20. 5th edition. HANSON, R. & ROSS, B.H., 1973. Washington. In: ROWAT, D. C. (ed. ), The Government of Federal Capitals, Toronto: Toronto University Press, pp. 77‑109. IGEAT, IGSO, LATTS & TSAC, 2007. ESPON project 1.4.3 Study on Urban Functions – Final report. Luxembourg. ESPON European Observation Network, Territorial Development and Cohesion. KÜBLER, D., 2005. Démocratie et gouvernance d’agglomération : quelques leçons européennes. In: Pouvoirs locaux. 35, No. 2, pp. 85‑91. KÜBLER, D. & SCHWAB, B., 2007. New regionalism in five Swiss metropolitan areas: An assessment of inclusiveness, deliberation and democratic accountability. In: European Journal of political Research. 46, No. 4, pp. 473‑502. LUYTEN, S. & VAN HECKE, E., 2007. De Belgische stadsgewesten 2001. Instituut voor Sociale en Economische Geografie, K.U.Leuven. SPF- Directorate-General Statistics and Economic Information, Brussels. SAVITCH, H.V. & VOGEL, R.K., 2000. Paths to New Regionalism. In: State and Local Government Review. Vol. 32, No. 3, pp. 158‑168. TAYLOR, G.D. & BASSETT, E.M., 2007. Exploring Boundaries in Governance: Intergovernmental Boundary Agreements. In: State and Local Government Review. Vol. 39, No. 3, pp. 119‑130. VAN HECKE, E., HALLEUX, J.-M., DECROLY, J-M. & MÉRENNE-SCHOUMAKER, B., 2009. Noyaux d’habitat et Régions urbaines dans une Belgique urbanisée. Brussels: Directorate-General Statistics and Economic Information. Socioeconomic study 2001, Monograph, 9. VAN WYNSBERGHE, C., 2003. Les capitales fédérées, une comparaison. In: Revue Internationale de Politique Comparée. Vol. 10, No. 1, pp. 63‑77. VAN WYNSBERGHE, C. and FRANCK, C., 2009. Bruxelles et le siège des institutions européennes: enjeux et perspectives. In DE GROOF, R. (ed. ), Brussels and Europe / Bruxelles et l’Europe, Acta of the International Colloquium on Brussels and Europe. Brussels: Academic and Scientific Publishers, pp. 153‑168. 3 Although there is no political or administrative implication, towns and urban areas have been defined in Belgium since the end of the 1970s [Van Hecke et al., 2009]. Recently, the same has happened at European level, within the framework of the ESPON programme (European Observation Network for Territorial Development and Cohesion) [IGEAT et al., 2007]. 5 According to the constitution, the City of Brussels (one of the 19 municipalities in the Brussels urban area) is the capital of the federal state. By extension and misuse of language, today the entire Region is considered as the capital, which justifies its official name, “Brussels-Capital Region”. 6 Throughout and around urban areas. It therefore does not involve simply making it easier to commute, but also to allow intra-urban travel. Caroline Van Wynsberghe is a political analyst and lecturer at Université catholique de Louvain. She co-directed the work “Le fédéralisme belge: Enjeux institutionnels, acteurs socio-politiques et opinions publiques” (Academia-L’Harmattan, April 2013).